At the request of several vets, we have compiled a brief guide for cleaning patient circuits. This guide is a simple reference to give you more insight into the cleaning procedures of the circuits. Is the patient circuit wet or damp after surgery? Do you want to avoid cross-contamination of patients? Did you perform a bronchial and/or a bronchoalveolar lavage of an animal? Have several animals used the same circuit without being washed? The time has come to clean the tubes. 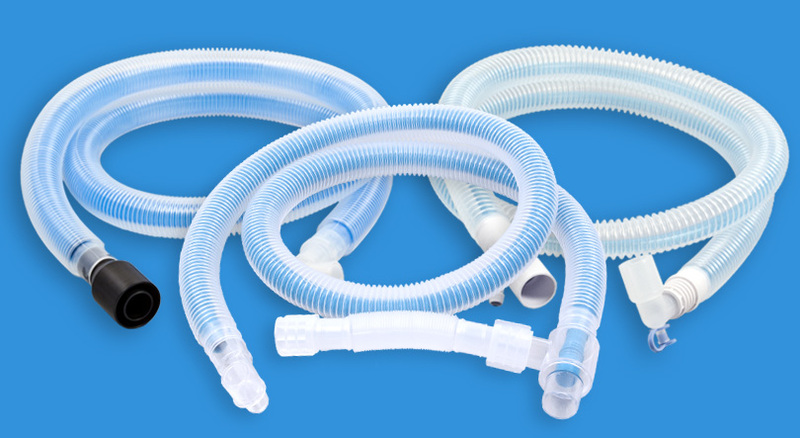 Clean and immerse the tubes in a virucidal solution such as Virkon® for a minimum of 10 minutes. Remove excrement and other filth and thoroughly wipe with a mop, sponge, cloth, or spray to disinfect the surfaces with a solution of Virkon® 1% w / v. A minimum contact time of 10 minutes is required. For laboratory equipment (patient circuit) and bowls, clean with a brush and soak in a solution of Virkon® 1% w / v for a minimum of 10 minutes (do not exceed 30 minutes for metal objects). When the soaking is finished, rinse and hang the circuits. By drying the tubes vertically, you reduce the drying time. During drying, shake circuits to eliminate water accumulation in the corrugations. If you notice mold in the circuits, it is important to dispose of it to avoid contamination of patients. The circuits should be disposed of if any signs of cracking or drying appear. It is important not to reuse them to avoid any gas leaks. Would you like more information about how to clean patient circuits? Contact us by email.